Data mining is the extraction of the valuable data from the large amount of data. There are numerous number of algorithms available for data mining. Single algorithm is not capable of producing efficient results. There is a key term in data mining known as ensemble learning which means combining two or more classifiers for the better result.I have used the KDD'99 dataset for the experiment which have 41 features labeled either as normal or as attack. 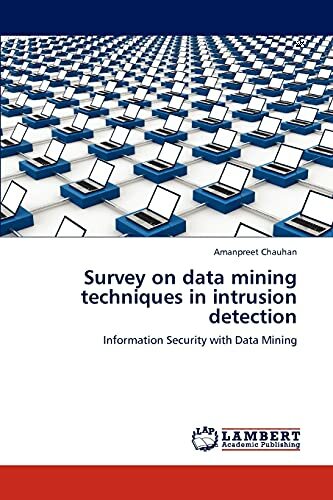 In this book I have represented how the graphical tool weka can be used for data mining and how ensemble learning can be implemented using weka. I have used three classifiers with the Bagging ensemble learning approach which are complementary naive bayes and two are rule based classifiers, part and jrip. My experiment shows that bagging improves the efficiency of the rule based classifiers as well as of naive bayes; however, the rule based classifiers become more efficient with bagging. Amanpreet Chauhan is born in India and has received his Bachelor's degree in Computer Science & Engg. from Malout Institute of Management & Information Technology,Malout India.Currently he is pursuing Advanced Diploma in Networking from Centennial College, Canada. He is RHCE and his areas of interest are Network Security,Linux & Data Mining.